Neighbourhood Spotlight: Meditation + Yoga + Art in Bayview Village - Distinctive Advisors Inc. I asked my friend, expressive arts collaborator and Yoga teacher, Jessica Cheung, to lead me through a guided meditation using one of my own paintings: Contemplation, #1. I found myself humbled and amazed by the experience of gaining something new and profound from something so familiar. After helping me to attain a sense of calm, Jessica asked me to look at the painting, encouraging me to let my gaze move softly over the image. I saw a young man, looking backwards over his shoulder and gazing up into the sky. I saw openings of blue sky amid the clouds. 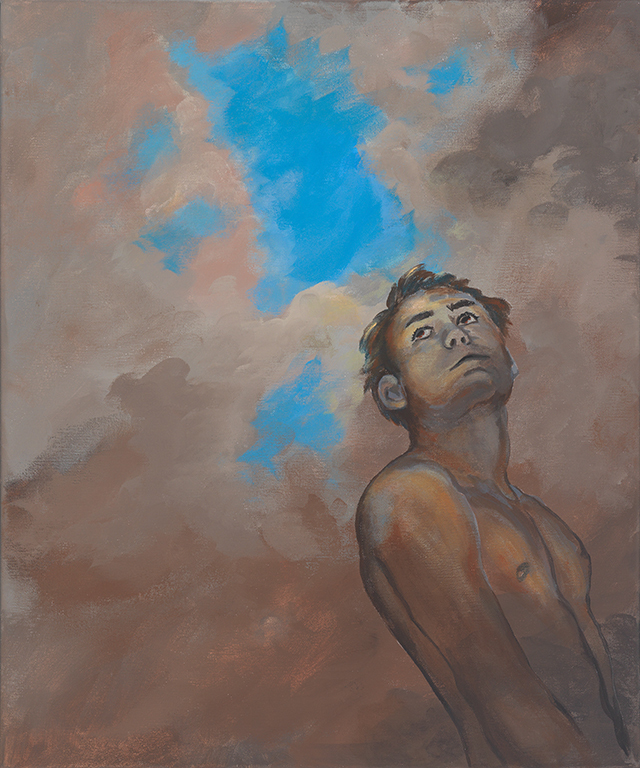 I observed the colours, the clouds and how the light moved over the figure. Then she asked me to imagine myself stepping into the young man’s body. Adolescent. Shirtless. She prompted me with questions: What are you standing on? What are you looking at? How do you feel? I explored the answers to these questions quietly, within myself. Within the young man, I felt that I seem to be longing for something: guidance, an answer or some comfort. I realized that I felt vulnerable and that I was looking for help from something beyond myself. My inner distress felt more difficult than I knew how to manage. I was wondering, hoping, looking for direction. When Jessica then asked me to look around and see what else I saw, my gaze moved from the sky above to what lay before me. The scene changed in a way that I hadn’t anticipated it would. Before me I saw a salt marsh. It was a salt marsh that I recognized. My husband and I have been to this place a number of times; it is one of our “happy places”. My gaze was focused on the upright reeds. The vibrant, green reeds of the salt marsh were strong and flourishing. I realized that I was entirely at peace in this setting; as if time itself was standing still. My feelings changed from those of tension and vulnerability to a restful sense of calm. Gently, Jessica brought me back to where I began the meditation, in the living room of my own home. The image of the robust reeds stayed with me and I pondered them over the next few days. This experience helped to clarify for me one of the most beautiful things about meditating on a painting: the experience can help to change one’s perspective. The image of the salt marsh was peaceful and powerful even though the salt marsh lives in a world that can, at times, threaten its survival. I realized that like the young man in the painting, I was feeling vulnerable and threatened as a result of my husband’s ongoing struggle/recovery from a health crisis. When reflecting on the experience I had of looking out over the salt marsh, I was struck by its strength. Even though one cannot see the ocean floor from which the salt marsh grows, its vitality is linked to its roots in the nourishing power of the ocean: ancient and sustaining. I realized that I too could be nourished and sustained in times of vulnerability. Like the salt marsh, I must drink deeply from the ancient and sustaining practices that bring me peace. I find that having a guided meditation on a painting is a comforting and enriching experience. I would like to invite you to join Jessica Cheung and I, as we offer a unique workshop series that brings together yoga practice with contemporary visual art, to explore how the skills of mindfulness and heightened awareness support meaningful engagement with the world around us and in our relationships with others. How interesting that your meditation took you in that direction and to that surprising ‘happy’ place. I wonder if you will approach your painting differently now, and even use this kind of meditation in the actual creation process. What a lovely journey your meditation took you on! So interesting to learn how art and meditation can heighten mindfulness and help bring a sense of calm. I’m sure others will find the workshop that you are hosting an enriching experience. This is fantastic! Congrats Carol!! Such an interesting connection between meditation and visual art- especially meditating with your own creation! What an excellent and fulfilling initiative. Swimming in deep waters of contemplation – inspiring. Truly. Carol, you have opened up a fascinating dimension in connecting visual art and meditation which, for me, explores and links our conscious and unconscious worlds. Your perspective, I would imagine, would be a powerful change element for those people who are searching for identity and direction. I’m so glad to see that you had a positive and enriching experience. Wonderful. Wishing you more of the same. I find it interesting and inspiring that you experienced something beyond even what you originally envisioned in your creation of art. What a wonderful miracle is the flight of the artist’s imagination ! What a wonderful description of your enlightenment. It was most inspiring and thoughtful. Your painting brings inspiration to all who view it. It’s fascinating to see what, given the right conditions, can surface from within. The insight you gained makes me think of the outcome of psychotherapy, which aims to put us in touch with our sometimes repressed emotions, make sense of them, and use the insight to move on productively. Your art, meditation and mindfulness seem to make a potent mixture. This is really great. Thank you for sharing not only your personal experience and enlightenment, but for opening OUR minds to a truly unique fusion of beauty. What a treat. What an interesting and stimulating experience it must have been for you to discover such new elements in your own work! I am touched as well by what a comforting place the meditation took you to. It speaks to your rich creative spirit and is an inspiration to all of us to look within. What a fascinating combination of art and meditation. Your experience was profound and inspiring. I’m anxious to learn more about others’ experiences in the sessions.